Posted on September 19, 2018 at 3:42 pm. It is far easier for me to do reports and post pics etc…. on facebook then try and put on this website. As a result if you want the most recent info of anything I post please visit the Walleye King fishing guide on facebook and like my page. Anytime I post it should show up in your stream. I have also put a facebook link at the top of this site so all you have to do is click on it and it will take you to my facebook page also. 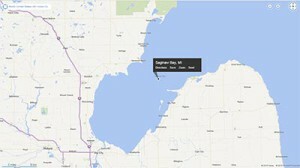 Thank you for your interest in my Walleye fishing guide services on Saginaw Bay & Saginaw River. Posted on December 24, 2017 at 2:36 pm. 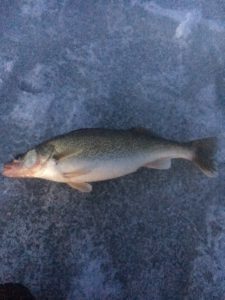 I was on Saginaw River 12-22 and 23 and ice was anywhere from 3 inches to 6 inches with bad spots all over. 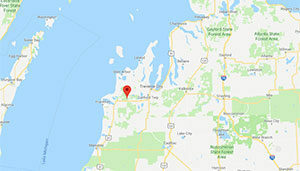 Saginaw Bay for walleye fishing is not ready yet to get out that far. Hopefully, in a few weeks, it will be. The action was hit and miss on Saginaw River. Peak time was right before dark. 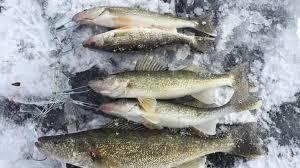 Also, check out Walleye King on Facebook as it is easier to posts reports there and I will be utilizing that more than this page when possible. We caught walleye, catfish, perch, sheepshead and shad. River is full of bait fish so there is a lot of competition for the fish to eat right now. Fish running a little small but every now and then we would get a nice little piggy. I am taking bookings now for January and February so call or email and let me know how many in your party and what dates you are thinking. Posted on December 14, 2016 at 1:04 pm. With these frigid temps hopefully we will be ice fishing on Saginaw River soon and then Saginaw Bay should be freezing up shortly after. If you are looking to book a trip now is the time. These trips also make a great Christmas Gift. Posted on January 21, 2016 at 4:48 pm. I went out on Tuesday January 19th and ice was hit and miss. My first 2 spots on the river didn’t have enough ice so spots 3 and 4 I found safe ice. spot 3 had 3 inches of ice and 20 feet away from it dropped to 1 inch, spot 4 had a solid 4.5 inches. It should be getting a little thicker every night hopefully. I got 2 nice eaters. 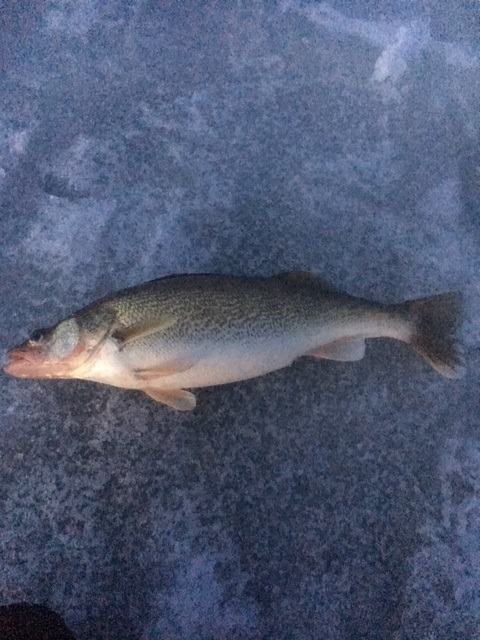 Nothing to write home about but it felt good to be on the ice and pulling some eyes up. They are going to taste just great! But it is only going to get better from this point on. Got a busy weekend so I will know more later. I still have some openings in February if you want to book a trip do it soon as dates are filling in. Singles are most welcome! Good luck and be safe. Posted on January 18, 2016 at 3:23 pm. Just a fyi…. For those of you that want to enter into the annual Shiver on the River contest you must sign up by January 29th. Contest runs Janauary 30th, 2016 – Feb 13, 2016. So get your entry in by the 29th because after that you can not enter. So if you are going to book a trip with me consider entering the contest as you just might catch a nice hog that will cash!